After a raucous debut, 'Death and Glory' takes a weird turn. Like a really weird turn. Imagine David Lynch and Quentin Tarantino had a baby and out came out issue two of this new series from Rick Remender and Bengal. The question is is that a good or bad thing? 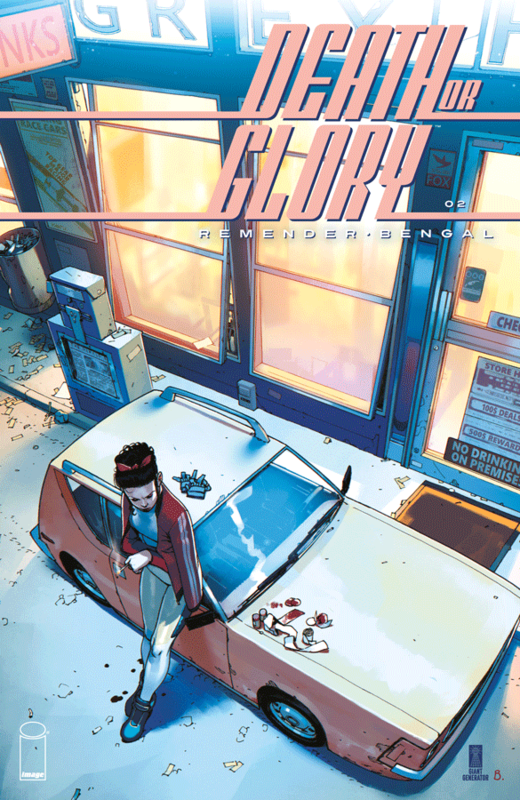 With a botched heist job, a bullet in her side, and all her money gone, Glory wrestles with what to do next. The cargo her ex-husband was trafficking wasn't drugs but people and after putting them all safely on a bus to Arizona, she's broke and being attended to by one of the Brazilians that stayed behind. Her scheme was pretty straight-forward - rob the money that the dirty sheriff was going to transport and use it for her dad's surgery. Easy peasy. Then it all went to hell as the sheriff recognized her, she dropped the money, and now no one is happy, not the sheriff, not her ex-husband, not the guy waiting for his human cargo. On the other hand, Remender might be trying too hard to add some crazy elements also along those 'Pulp Fiction' lines. There's the over-the-top slimeball of an ex-husband, the shady psychotic buyer of the human cargo, and one bizarre scene involving peppers that the inept sheriff and deputy share. That scene, in particular, had me thinking,"why are you making Bengal draw such a gratuitous scene, Rick Remender?" And speaking of Bengal, the art is as impeccable as the first issue. There's less action but plenty of new locations that require a specific tone. The darker grim appearance of a holding cell, the brighter but specific lighting of what appears to be an operating table and it's all in contrast to the sun-lit exteriors where we find Glory mostly contemplating what to do next. For an artist whose designs can be so buoyant, Bengal can tap into his dark side. Again, I blame Remender. I'm on the fence about 'Death of Glory' now after reading the second issue. After some twisted turns, I'm not sure it's where I want to go. Yet, I can't deny the incredible art and storytelling execution. For all its weirdness, Remender writes a compelling if not thrilling crime story. I just hope it's worth all the cringe-worthy detours he puts us on and whether it's worth the shock value? The bottom line is it's too early to tell if this a stroke of genius from one of comics' most prolific writers or the early warning signal of a heaping flaming sewage barge headed right for us. There's only one way to tell - see you next month when I review issue three aka Remender's Reckoning.